We’re excited to announce some new Ops Portal features to help you better manage your tank levels! It’s the feedback from you all, ur Tank Utility user-base, that guides our product development. This message is intended to keep you up to date, give a little explanation on how things work, and why we built these features. Deliveries Dashboard: Of the three features we’re releasing, this packs the biggest punch. 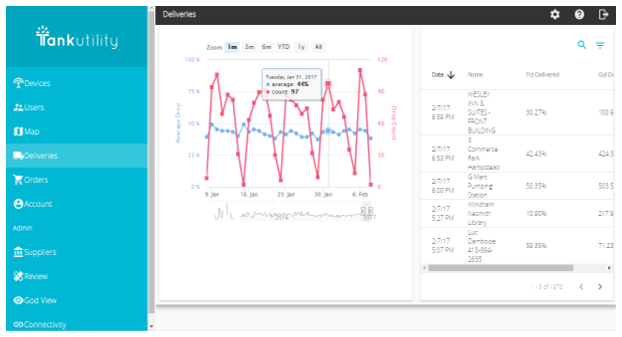 Live, real data about your drop sizes gives you the ability to keep an eye on your efficiency performance, track improvement, and take notice of your unnecessary small deliveries. Improved Alerting Configuration page to make it easier to opt teammates into alerts, especially on mobile devices. Enhanced Maps – to include search and filtering functionality. In some browsers you may need to refresh your cache to get these changes to fully take effect. If you haven’t already and the portal formatting looks weird, please follow these instructions. If you have any questions about any of these improvements, don’t hesitate to give us a call or send us an email. And, as always, we are eager to hear of additional features that would benefit your business!